Do you tick any of the above? If so, we can help with all of your conservatory needs. Our DIY conservatory kits are so simple to assemble and can be completed in just a few days. We offer an extensive range of styles, finishes, sizes and colour options giving you maximum flexibility and choice. All of our uPVC systems are tailor made to meet your unique specifications. Free installation guides & a comprehensive base guide to ensure a smooth installation from start to finish. Various payment options to suit your conservatory budget. We constantly strive to offer the very best value for money. Find out what our prices include. If you are looking for a beautiful and timeless addition to your home then a DIY Conservatory from Prior Conservatories is just the do-it-yourself extension you are looking for. Whether you want an elegant Edwardian style, ornate Victorian design, or a Modern lean-to. 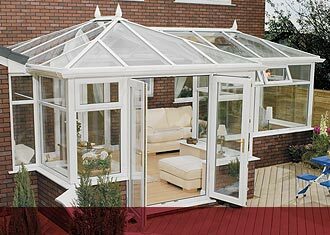 Prior Conservatories has an extensive selection to choose from, and we are sure you will find exactly what you are looking for! Prior Conservatories present a superb range of easy to install DIY home extension kits. All of our uPVC systems are tailor made to meet your unique specifications, and are accompanied with free conservatory installation guides and a comprehensive base guide to ensure a smooth installation from start to finish. We fully understand that your DIY conservatory kit must not only provide a practical solution to your requirements, but must feel and look stunning. If you are in need of an additional room such as a dining room, playroom or just a haven where you can bring your garden into your home, a self build conservatory kit will give you extra space all year round. With the addition of our energy rated PVCu windows, our DIY conservatories are truly useable all year round. Choosing your design couldn't be easier with Prior Conservatories, whether you are an enthusiastic do-it-yourself homeowner, fitter, contractor or builder by trade, our DIY conservatory kits are so simple to assemble, and the home extension can be completed in just a few days. There is no need to buy expensive new tools as the majority of the construction work requires something we all possess, skill and determination. Our extensive range of different conservatory styles, finishes, sizes and colour options give you maximum flexibility and choice. We supply top quality conservatories that are designed and manufactured by us to the highest specifications, thus giving you peace of mind that the system you are using truly is of the highest possible quality. The reason for this is simple, at Prior Conservatories we work hard to ensure that not only are you getting the best quality product, but also the best value money can buy. Ultimately by not using a specialist installer you will save thousands of pounds on your DIY conservatory building project,and as we source all of our systems directly it allows us to pass this saving onto you the customer, resulting in a market leading design at a competitive cost and of top quality. A Prior DIY conservatory fitted with energy rated windows will create a versatile and easy way to increase living space that can be utilised throughout the seasons, making your extension a fantastic investment for your home and garden. On this website you will be able to see our full range of uPVC DIY conservatories and self build extension kits for sale, and can produce conservatory designs which can then be viewed via images created using our step by step online system. Our online design system will help you price, plan and visualise what your personal building project will look like upon completion. Don't forget - we will manufacture here exactly what you want! We specalize in bespoke designs that other companies cannot supply. Prior Conservatories, Bird Industrial Park, Station Road, Long Marston, Warwickshire, CV37 8RP. VAT Number 488 0134 37 | Company Registration Number 3673473 | © 1998-2019 Prior Products Ltd.